A public institution, Cleveland State Community College exists to serve those in our community with excellence and transparency. That is why all our staff and faculty members are committed to providing students, their families and the campus community full disclosure of all consumer information as required by state and federal laws and regulations. On top of helping Cleveland State maintain quality programs, these laws satisfy students’ right to information and provide the opportunity for students to make fully informed choices regarding the institution they choose to attend. Cleveland State Community College places the highest priority on your safety. We rely on community members to share our commitment and actively participate in creating a safe and secure living, learning and working environment. Cleveland State Community College’s annual crime statistics include data for the previous three years concerning reported crimes that occurred on or around the campus. You can find crime statistics and other campus safety information by navigating to the Cleveland State Community College Campus Police web page. To obtain other safety-related information or to speak with an officer, please contact the Campus Police at 423-478-6236. The Drug-Free Schools and Campuses Act of 1989 requires all students be notified annually of Cleveland State Community College’s Alcohol and Drug Abuse Policy. Other policies regarding student conduct and sanction for violations can be found in the current edition of the college’s Catalog and Student Handbook. Read the CSCC 2015-17 Biennial Review of the Drug-Free Schools and Campuses Act activities. Cleveland State Community College adheres to the Family Educational Rights and Privacy Act of 1974. Policies under this law ensure that current and former students have the right to review, inspect and challenge the accuracy of information kept in a cumulative file and that student records cannot be released without consent of the student, except in response to a subpoena or in the case of an emergency situation involving safety or health. Disclosure would be limited to necessary information and only to persons in a position to assist in the emergency situation. Further, any person requesting information that is considered directory information may obtain such information without consent from the student. Directory information includes name, address, telephone number, date and place of birth, photograph, major field of study, full-time/part-time status, participation in officially recognized activities and sports, weight and height of members of athletic teams, dates of attendance, degrees and awards received and the most recent previous educational institution attended. A student may refuse to allow disclosure of any designated directory information by contacting student records staff to make an official request. The Social Security number of applicants is secured when the application is processed. An alternate campus identification number is assigned through our records system. Students are advised to keep their assigned campus ID number available and use it instead of their Social Security number. For further information involving the Privacy Act, please refer to the Cleveland State Community College Catalog/Student Handbook, or call the Office of Admissions and Records at 423-478-6214. In compliance with the Equity in Athletics Disclosure Act, the Cleveland State Community College Athletics Department reports required information to the National Junior College Athletic Association (NJCAA). This information includes athletic graduation rates, the number of male and female athletes on campus, the expenses and athletic aid spent on each sport, recruiting expenses, annual revenue and salaries for all coaches. Athletic program participation rates and financial support data is also available. The Act and data on athletic program participation rates and graduation rates of athletes can also be obtained by calling the Athletics Department at 423-473-2271. Consumer disclosure information relating to financial aid includes cost of attendance, description of need and non-need aid types, application procedures and processes, student eligibility requirements, students rights and responsibilities, criteria for selection of recipients and awarding funds, disbursement information, refund and repayment policies, satisfactory academic progress policy for financial aid, appeal procedures, financial aid availability for students abroad and VA/military benefits. All of this information can be accessed on the Cleveland State Community College financial aid web page or by contacting the Financial Aid Office at 423-472-7141, ext. 284 or 800-604-CSCC (2722), ext. 310. 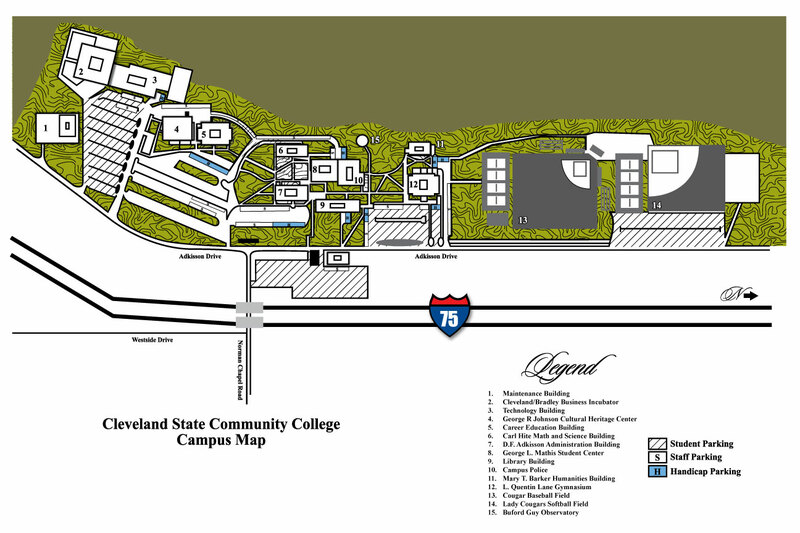 Your electronic award notification certifies that you are planning to attend Cleveland State Community College. If after reviewing the award notification, you decide NOT to attend Cleveland State, you must notify the Admissions/Records and Financial Aid Offices in writing. In addition, if your classes are not dropped in a timely manner, you may be liable for a portion of your tuition and fees. If you fail to attend all classes or withdraw from classes, you may owe a repayment to the Department of Education. Complete your Title IV Authorization Form by logging into CougarNet. Click on the Financial Aid tab, then click on the Title IV requirements listed, carefully read each statement and submit your responses. Your financial aid will be credited toward your tuition and fees. If your financial aid has not been processed or is not enough to cover tuition and fees, then it is your responsibility to pay the balance by the payment deadline date. Your classes will be canceled if you do not complete the payment process with the Business Office by the payment deadline date at close of business. Please see Tuition, Fees & Deadlines posted by the Business Office. Cleveland State distributes refunds to students using either direct deposit or paper check. If you wish to receive all refunds by direct deposit, you will need to log into CougarNet, click on the My Account tab, then update and submit your direct deposit information under the My Statement section. If no direct deposit information is submitted, a paper check will be mailed to the permanent address currently on file. Books are available for purchase through the college bookstore. The cost of books is approximately $1344 per year. Students who have excess financial aid funds available after tuition and fees have been accounted for will have a credit available in the Cleveland State Bookstore, not to exceed $800. Bookstore credits are available 2-3 weeks prior to the start of each term and remain available until the 12th day of classes. Students in Regents online classes should visit the ROCC website. Students or prospective students who wish to file a complaint related to accreditation or regarding violations of state law not resolved at the institution may submit a Student Complaint Form to the Tennessee Board of Regents at 1415 Murfreesboro Road, Suite 340, Nashville Tennessee 37217, or by going on line and filing out the form electronically at http://www.tbr.edu/contact/default.aspx?id=2936. Under Tennessee’s open records law, all or parts of complaints will generally be available for review upon request from a member of the public. Complaints of fraud, waste or abuse may be made by email at reportfraud@tbr.edu or by calling the Tennessee Comptroller’s Hotline for Fraud, Waste and Abuse at 800-232-5454. Cleveland State Community College (CSCC) addresses student achievement through two Key Priorities (Goals) in the College’s 2015-20 Community First Plan. Further, the College is held accountable for student achievement by the Tennessee Board of Regents (TBR), the College’s governing board, and the Tennessee Higher Education Commission (THEC). State funding for CSCC through THEC is tied directly to student achievement and progression.